Sitting down with an issue of SageWoman always feels like a cup of herbal tea with the Aunts from Practical Magic: you know you’re going to be settling in for a while, and when you get up, you’ll feel wiser and more centered for doing so. Issue 81: Weaving the Web is a perfect example of this. It’s the 25th Anniversary of the magazine, and there’s an article in it to commemorate the 30th Anniversary of the Motherpeace Tarot — both of which situate the issue in the heartland of the women’s spirituality movement so completely that even a first-time reader would feel it. Highlights of the issue for me were Marilyn Steele’s “Life in the Round: Spider Woman Speaks”, Julie McIntyre’s “In the Presence of Wilderness”, and Diana L. Paxson’s “One of Ten Thousand: Weaving Frith with Lady Frigga”, but it felt like every article had a take-away thought, quotation or snippet to ponder. As always, there are beautiful illustrations accompanying the articles and a collection of reviews and poetry. The issue’s theme of ‘Weaving the Web’ was explored in such diverse ways, but the whole came together like a tapestry and a reminder of the connectedness of all life and, in particular, the necessity of community in women’s spirituality. Marilyn Steele’s “Life in the Round: Spider Woman Speaks” is a call to action in the guise of prose-poetry. “We have forgotten what it means to be human, to be connected to wildness,” she writes. “It is time to become a culture of dreamers, to awaken to the ecology of self we need.” (p. 16) The piece took me time to digest, and I enjoyed doing so greatly. Julie McIntyre’s “In the Presence of Wilderness” resonated on a deeply personal level for me, and I suspect many other women reading it will feel the same way. She writes of connecting to the land she’s on and finding herself as a wild thing within a context of other wild things. It’s a journey many of us are on and the article underscores the joyous mystery of reclaiming that part of ourselves. Diana L. Paxson’s “One of Ten Thousand: Weaving Frith with Lady Frigga” is a transcription and account of a tutelary ritual that took place at PantheaCon 2011. As a heathen who has spent many years working with Frigga myself, I would deeply loved to have been present at the ritual, but the account is certainly a vivid retelling of what transpired. To my mind, an issue themed around ‘Weaving the Web’ would have been incomplete without reference to Odin’s wife, and this definitely satisfies. The ritual as described was rich and touches upon the many layers of ‘weaving’ that are sacred to this goddess — in the sense of literal fibrearts and in the more abstract notions of connection, community, and trust. 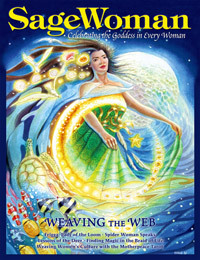 The closing of Borders had left SageWoman with a $12k shortfall at the time of the issue going to print, but the editorial by Anne Newkirk Niven articulates a message of hope and trust in the Goddess to provide, and a resolution to continue serving the women’s spirituality community for another twenty-five years. Her faith seems to have been well-placed: at the time of this review, a little more than $11k has already been raised! If that isn’t an illustration of the power of interconnectedness and community, I don’t know what is.